If you are just one teacher that wants to do this at your school, I can STRONGLY recommend that you don’t do this alone. Make sure you recruit another teacher to also setup a class blog for their class and that way, you can work together – bouncing off ideas and working through issues together. Then when you do work it out, it’s much easier to spread across the whole school from a base of two classes rather than a base of just one. The first thing you’ll need before you even go anywhere near a blogging service is a username and a title for your class blog. The username needs to be one word (no spaces) and should relate somehow to your preferred blog title. Finding these names is a great classroom activity that can involve all students and get them enthused about the class blog from the onset. While “Class 5J” might be the name of your class, it’s not a great name for a class blog. For a start, there’s probably a lot of “Class 5Js” around the world. “Room 14” also isn’t a great name as it shows little imagination. Instead of these obvious (and boring) identifiers, why not turn your class into a blogging team with an appropriate TEAM name suggested by and democratically agreed to by the students? Your students probably have a lot more imagination than I do, but a class at a waterside school might call themselves “The Splashtastics” or a Gifted and Talented class might call their blog “Smarticles”. You should probably come up with three different names, just in case your preferred name has already been taken at your preferred blog service. Ultimately, it’s probably best not to divulge your school name in your blog. It’s fine enough to say which city or town you are in and focus more on the “team” than on the school. Now while the students are being busy thinking about a username and a blog title, the teachers can consider which (of the many freely available) blog-hosting services you’ll use – oh yes, and a password for your blog. People don’t seem to take passwords seriously, so I invite you to read this article – by the end of it, you’ll be thinking about changing all of your passwords using that method. As for blog-hosting services, I’d suggest you don’t try to host it yourself on a server in your own school, for a start, the setup can be complicated and you’ll probably end up restricting your audience to the people within the school only. When there are so many good, free services available offering great features, it makes little sense to try and reinvent the wheel. The obvious starting point is EduBlogs.org – they currently host over 100,000 blogs created by schools, teachers, librarians, lecturers, school administrators and individual students. For the cost of zero dollars, you get 100MB of space per blog with no ads and the ability to upload images, photos and videos – but if you start getting into videos, expect that 100MB to disappear pretty quickly. Fortunately, for US$25 per annum, you can upgrade your available space to 1GB. If you want to really splurge, starting at US$500 per annum, you can get 50 linked blogs for your students, each with unlimited space. More details here. Another option is PodBean.com which promotes itself as a platform for hosting podcasts and vodcasts (videos), but is really a blog-host. Their free service also offers 100MB of space with a 1GB upgrade for US$24 per annum. Interestingly, both of these services are actually based on the WordPress blogging engine, so they look pretty much identical to each other. And speaking of WordPress, we can’t forget WordPress.com – where this blog is hosted. Why did I choose WordPress.com? At last count, almost 3 million blogs are hosted here. For the basic FREE price, you get 3GB of disk space with unlimited bandwidth. The limitation here though is that you cannot upload videos and podcasts without paying for a space upgrade. For US$20 per annum, they’ll give you an extra 5GB of space with the audio/video restriction removed. Plus, being hosted by the makers of WordPress means you get all the latest updates to their blogging engine as soon as they are developed. There are several other free hosting providers, but I don’t believe they can compete effectively on features and price. If $20 per annum is not a concern, I can highly recommend WordPress.com. If you want to do it for free, go for EduBlogs.org. If you want your students to individually blog, definitely go for the EduBlogs Campus product. So after setting up your class blog, how would a school pay for the upgraded hosting service? Basically, a teacher should pay for it with their credit card, print off the receipt and then get reimbursed by the school. That’s by far the easiest way. In the next article in this series, we’ll look into the structure of a good blog, useful widgets and managing the blog. Until then, feel free to share your thoughts with us in the comments section. We used Blogger for a while but jumped over to EduBlogs. The WordPress engine is so much better, but you are restricted a little with the widgets you can add. But too many widgets detract from the whole point of the blog, the class work! We’re just starting again for this year, so I’ll send through a URL when we’ve got some content. Great series of articles and I really love the cartoons. So clever. Thanks James O. I’ve played with Blogger myself and came to the same conclusion. I’ll be talking about widgets in the next article. Glad you like the cartoons. My son’s on school vacation so he’s had some time to do them for me rapidly. “Online you success and progress” – I completely agree with you! Thanks. Edublogs is excellent for managing multiple blogs for students, but the deal with WordPress sounds great! When did they change the 50MB free limit to 3GB? 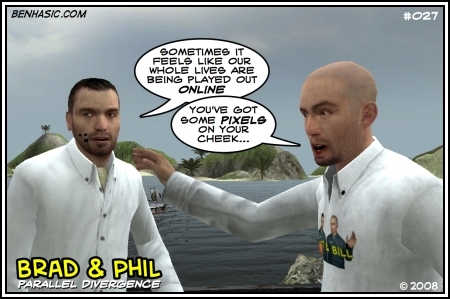 These Brad & Phil cartoons are truly excellent. All you need to do is upload the audio to the assigned folder and the xml file is generated by the php script. Hi Jennifer. WordPress.com upped the non-video/audio limit to 3GB in January 2008. For US$20, to get 8GB in total including audio/video and unlimited bandwidth is pretty amazing. A couple of my articles front-paged on Digg and with WordPress, there were no issues! I’ll tell Ben you like Brad & Phil. Liam. It’s always good to present to a receptive audience. Sure, there were a lot of questions and a bit of resistance, but things have to change and I believe they will. Thanks for the info. Took a look at your site. Well done! But you definitely need a new mic on that latest podcast 🙂 – Make sure you take a look at Podcast Lane – http://podacstlane.wordpress.com – I like the way the MP3s are integrated in the page. There will always be some resistance; I’ve dealt with it by going it alone and doing what I do with my students in mind, not teachers. That said, there are a surprising number of younger teachers who are very receptive. Pocast lane looks very useful; thanks! http://zvonnews.sourceforge.net/ which you can edit as much as you like. Thanks for the links Liam. The Flash Player update problem you refer to is die to the filters. You can download a single-file installer for Flash 9 from the NSW DET Software site. I’ll email you the URL.